British Standard Pipe (Taper Thread) BSPT (British Standard Pipe Thread) is very similar to the NPT with one important difference, the angle across the flanks of the threads. If you were to slice the BSPT fitting in half, long ways, and measured the angle from the root crest to root, it would be 55 degrees instead of 60 degrees, as it is for NPT. 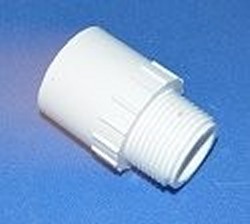 A NPT male adapter will fit into a BSPT fitting or vice versa, but they will not seal properly. The British Standard Pipe Thread fitting is most popular in China and Europe and is rarely used in North America, unless the equipment to which it has been imported needs the BSPT fittings to finish any assembly. There is another British Pipe Thread: BSPP (British Standard Parallel Pipe). It uses a washer, usually of copper, to make the seal. Unfortunately we do not stock any of that type at this time. BS436-015 Male Adapter 1.5 inch BSPT x 1.5 inch slip socket.